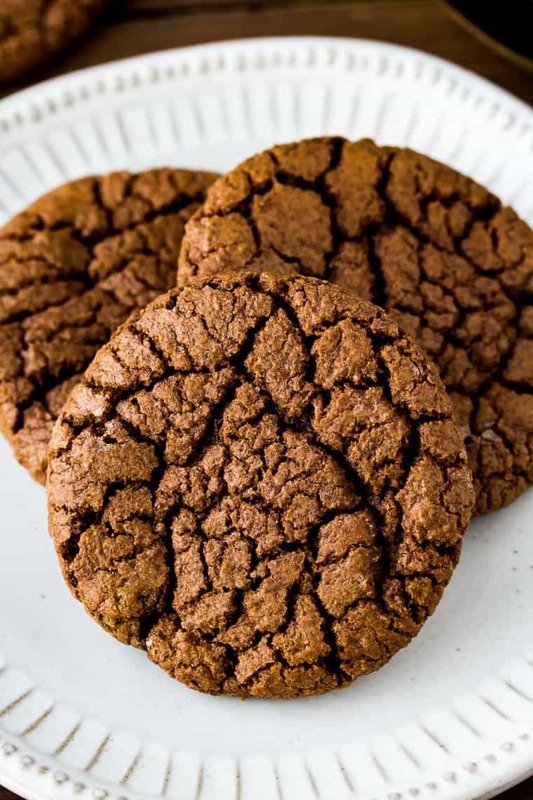 These Gluten Free Basic Chocolate Cookies are so rich and chocolate-y! Serve them plain or with your favorite mix-ins and no one will even know they are gluten free! 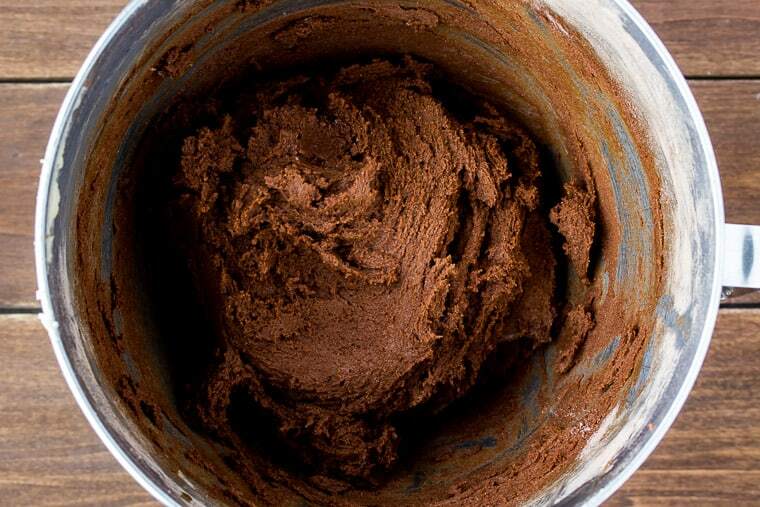 Need a recipe for plain gluten free chocolate cookies? One that tastes great and won’t crumble into a million pieces? One you can add your choice of mix-ins to and it’ll hold up? You found it! These Gluten Free Chocolate Cookies came about after feeling guilty for making Dark Chocolate Cookies that my gluten free fiancé wasn’t able to eat. I simply swapped out the regular all purpose flour for a gluten free all purpose flour and viola! These cookies turned out amazing – you can’t even tell they are gluten free! These homemade gluten free cookies taste just as delicious as a non-gluten free version. The cookies come out of the oven soft in the center with crispy edges just as you’d expect any homemade cookie to be. This is a versatile recipe that you can enjoy on it’s own, or add mix-ins like chocolate chips, caramel, nuts, or even fruit bits to. Make sure to set your butter out to come to room temperature about an hour before you begin baking. If your butter is too warm (if you microwave it to soften it this can happen) or too cold, the cookies may not turn out perfectly. When you are ready to begin, preheat your oven to 350°F. 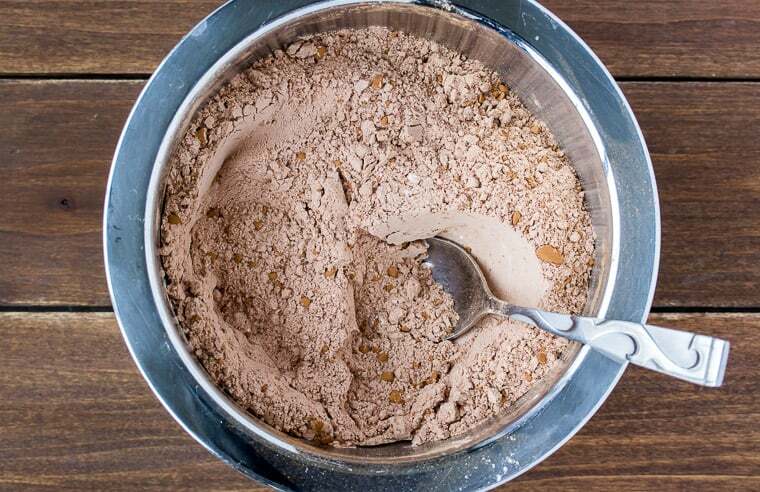 In a medium bowl, combine the gluten free flour, cocoa powder, baking powder, baking soda, and salt. Mix well and set aside. 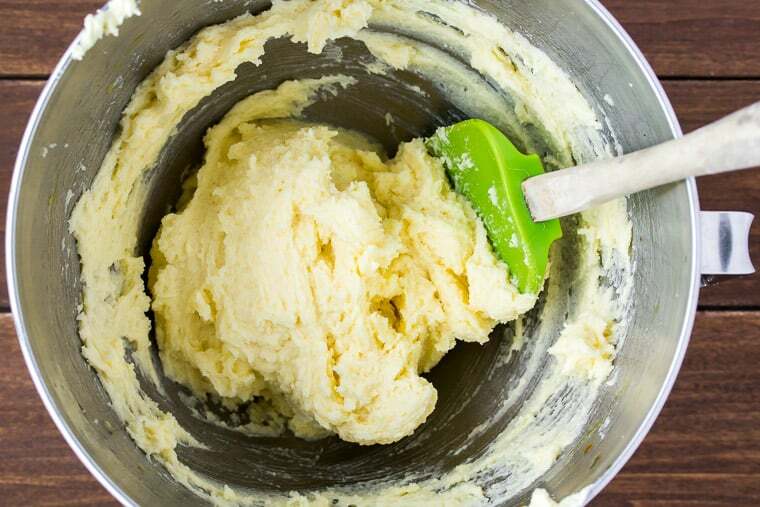 Add the butter and sugar to the bowl of an electric mixer. Cream together on medium speed until completely smooth. Lower the speed and add the eggs one at a time, then the vanilla. Gradually add the flour mixture to the wet ingredients and mix until well combined. Stir in any mix-in’s, if you’re using them. Drop by the tablespoon full about 2 inches apart on to a baking sheet (I use a Silpat mat to prevent sticking). Bake 9-10 minutes until cooked through. Allow to cool on the baking sheet for about 5 minutes before transferring to a cooling rack to prevent breakage. 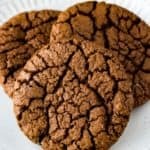 Serve these Gluten Free Chocolate Cookies warm out of the oven, or cooled. They go great with an ice cold glass of milk! Make sure your butter is room temperature soft. If it’s too warm (as it might be if you microwave it to softened it) or too cold, the final results of the cookies may differ. Don’t pack the flour into the measuring cup. Simply spoon it in and level off the top. Be sure to allow the cookies to cool on the baking sheet for about 5 minutes before moving to a cooling rack. If you attempt to move them too soon, they may break. They “set-up” more as they cool. Store extra cookies in an air-tight container and use within a week for the best results. What is the best gluten free flour to use for baking cookies? I have made this recipe with both Pillsbury Gluten Free All Purpose Flour and Bob’s Red Mill Gluten Free All Purpose Flour. I found that the cookies made with Pillsbury puffed up a little more, but broke a little easier. The cookies made with Bob’s Red Mill had more “crinkling” on top but held up a little better. Can you freeze these gluten free cookies? Yes. You can roll out the dough ahead of time and store it in a freezer bag in the freezer for up to 3 months. Be sure to add a couple minutes to the bake time. 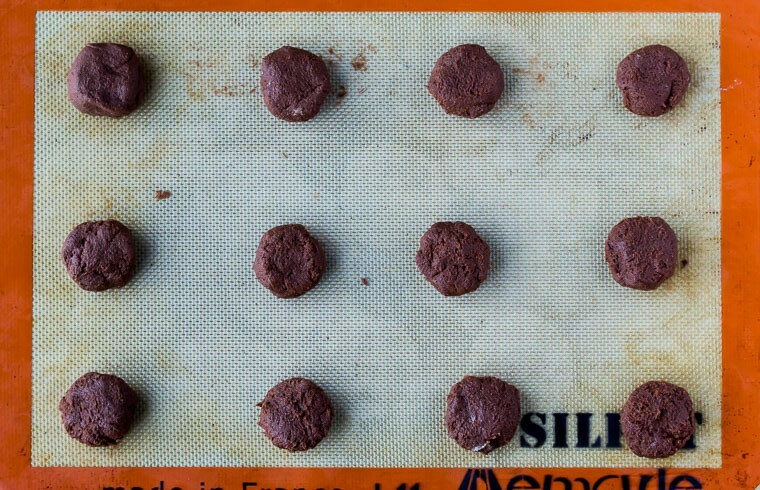 You can also freeze baked cookies on a baking sheet first, then transfer to a freezer bag. 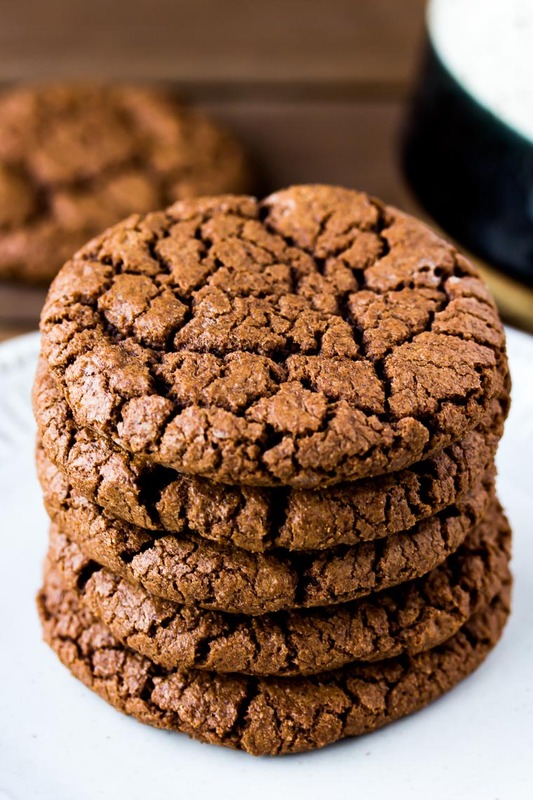 Love this Gluten Free Chocolate Cookies recipe? Follow me on Pinterest, Instagram, and Facebook for more! These Gluten Free Chocolate Cookies are so rich and chocolate-y! Serve them plain or with your favorite mix-ins and no one will even know they are gluten free! Drop by the tablespoon full about 2 inches apart on a baking sheet (I use a Silpat Mat to prevent sticking). Make sure your butter is room temperature soft. If it's too warm (as it might be if you microwave it to softened it) or too cold, the final results of the cookies may differ. Don't pack the flour into the measuring cup. Simply spoon it in and level off the top. Be sure to allow the cookies to cool on the baking sheet for about 5 minutes before moving to a cooling rack. If you attempt to move them too soon, they may break. They "set-up" more as they cool. What is the best gluten free flour to use for baking cookies? I have made this recipe with both Pillsbury Gluten Free All Purpose Flour and Bob's Red Mill Gluten Free All Purpose Flour. I found that the cookies made with Pillsbury puffed up a little more, but broke a little easier. The cookies made with Bob's Red Mill had more "crinkling" on top but held up a little better. ** nutritional information is an estimate and may vary. It does not account for any mix-ins you may add to the recipe. This recipe was originally posted on May 30, 2016. New images and text were added in January 2019. The recipe itself was not changed. Mine came out a little flat and not puffy like the picture. Ahh sorry to hear this! Usually this might be related to the butter being more melted, then just softened, like it you left it at room temperature for awhile. I haven’t had anyone else have this issue, but baking can be so sensitive to the smallest differences. I’ll be testing this recipe again soon just to be sure! These cookies look perfect and so soft. I love them both plain and with the mix-ins. Love that they are also gluten free! I love that these are gluten-free. I love having them on hand sometimes for my sweet cravings. Love how simple and easy this is. Saving this for later. I’m making this recipe for my daughter plus including the recipe. She has to watch her wheat intake and she simply loves chocolate cookies. This recipe is perfect for her. My fiance avoids gluten most of the time and ate almost the whole batch! Hope she enjoys them! Gluten free cookies are tough to make, these ones look delicious though! I’ll be adding these to next week’s cookie baking time. Definitely took some experimenting, but we love the results! I cant believe these gorgeous cookies are gluten free. Looks so so good! 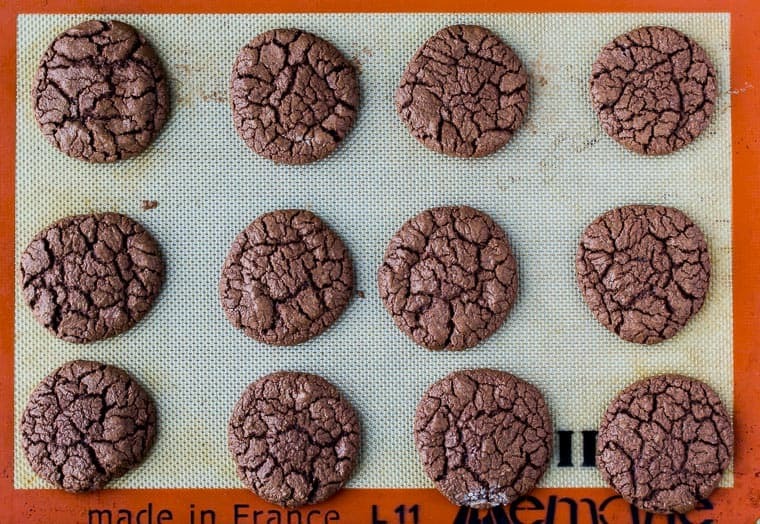 Oh God, I want to eat these Chocolate Cookies every day! My whole family would go crazy for these! Love Love Love this recipe! What an awesome recipe to have on hand – baking to suit everyone is so hard! This recipe would simplify it! Thank you! It can definitely be challenging! These sound delish, they would be the perfect chocolate cookie for making an ice-cream sandwich!! I love that these are gluten free. I am going to send this one to my sisterinlaw that has gluten allergies. She is a huge chocolate fan! My youngest is gluten-free and would enjoy these cookies. I usually use 1-for1 flour, I wonder if that would turn out as well. I can’t say for sure, but I honestly don’t think quite as well. This combo of flavors worked best through a few tests and it’s been awhile so I can’t remember what all we tested. These are wonderful as a basic cookie! I did 2 sticks of butter on accident but let them cook longer and I flattened them a bit. My sister whom is cileac will love them. They are so tasty! I tested and my anti gluten free spouse did as well, couldn’t tell and wanted more! I also used 2 1/2 cups choc. Chips ???????? Yay! I’m so glad they worked out great for you too! I hope your sister loves them! I’ve never made gluten-free baked goods, but I’m definitely saving this to fix for my sweet friends who have gluten allergies. They look and sound so delish! These look really delicious. I would make them first, let the family eat them and then tell them what I did different. They would never know the difference.